The one day I didn't photograph my lunch! I was at a working lunch at a new restaurant called Theory a couple of days back. It is located at central Mumbai's Kamla Mills Compound beside The Bombay Canteen, and Koko. Some friends of mine say that Koko is their favourite place for Asian food. I am yet to go there myself. Bombay Canteen has of course remained a crowd favourite ever since it opened and my visits to it didn't give me any reason to wonder why. So that's quite a 'good food' neighbourhood to be located in for Theory. Does it live up to it? The restaurant was fairly empty when I went but I had reached at 2.30 pm on a working day which is well after lunch time. I found our group and settled down at their table. What struck me about the restaurant was that it offers a pleasant sense of space which one often misses in restaurants in Bandra where I live. The decor is elegant and has a wood based motif which exudes a feeling of warmth even though it is less well lit compared to say a Bombay Canteen next door. That can get gloomy specially in the rainy weather but the lighting and the open seating plan took care of that I feel. The seating was fairly comfortable. They have a semi open kitchen and you can sense the energy in the kitchen. I ordered from the restaurant's regular menu and then chatted with my hosts while we waited for the food to arrive. This was my first visit to the restaurant. I didn't take any photographs of what I ate at the beginning as I thought that it would be rude to do so. I later wished I had as the food turned out to be really good and I thought that I should tell you about this place. 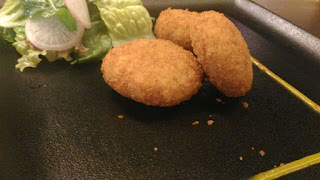 The first dish that I tried were the crab fish cakes which my hosts had ordered for me. They (the fish cakes and not my hosts) seemed to be delightfully deep fried. The outer casing was crunchy while the shredded crab meat filling inside was pleasantly moist and was bursting with flavours of crab. I dabbed a bit of the cake on what seemed to be a mango chutney drizzled on the plate and the combination of tart and fish worked well. It was the sort of dish that made me stop in between our discussions and pay attention to the food instead. Its excellence demanded attention and yet it felt like comfort food. What's not there to like about a good Chinese pakora (the chef will cringe) in the rains? Next on were the duck bao that I had ordered. I had a very nice pork bao at Ling's Pavilion at Colaba the previous night. The softness of the bao impressed me at Ling's. It was the perfect foil to the ginger and onion infused pork mince patty. The patty was enveloped by the bao to form a pouch in the best traditions of Cantonese dimsum. 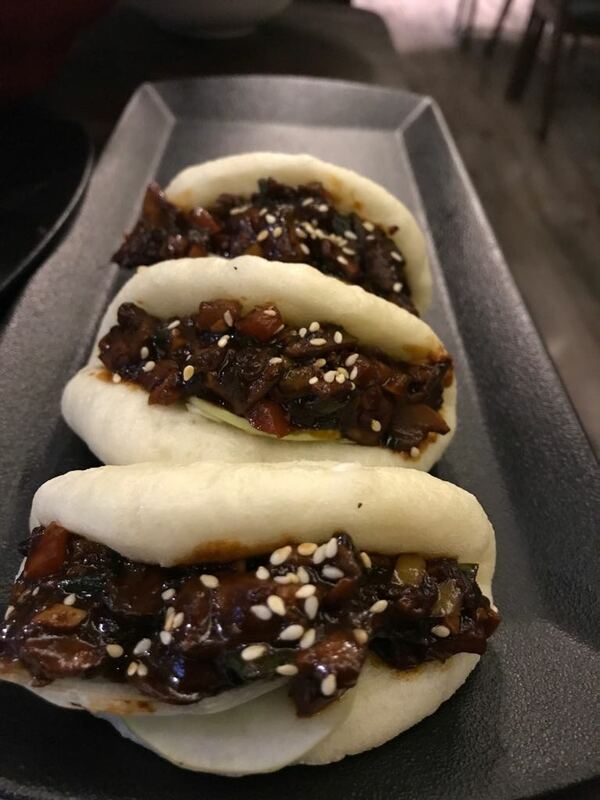 At Theory the bao (steamed bread) was half rolled up like a sandwich, a style made famous by Momofuku in New York. What impressed me at Theory was how, once again like at Ling's, the baos were adequately pillowy, and the quality of the meat was so good. The meat was juicy and not tough at all. Duck meat is game meat and if not cooked well can be tough and smelly too. No such problems at Theory. The meat had an intriguing smoked feel to it and the spicing strangely enough brought back memories of the sheekh kebabs at Haji Tikka at Bohri Mohalla and tasted really nice. I say 'strangely' as Haji Ali is a Muslim joint and is very different from the modern western bistro experience that Theory seems to offer. Later, on asking the chef, I found out that the spicing used for the duck in the bao at Theory is the Chinese 5 spice. Hoisin sauce and honey based sauces are often the sauces of preference of restaurants in Mumbai for both pork and duck based Asian dishes. When used without a sense of balance this can be disastrous. I am yet to recover from the dessert like pork bao that I had in a visit to Fatty Bao in Bandra a few months back. Asian cooking does use sweet notes at time and that, if not balanced well is not to the taste of all. What I loved about the pork bao at Ling's the previous night and the duck bao at Theory was that the chefs had used savoury notes as the flavour base to come up with a spicing which showcased the meat and didn't over-shout the way the characters in a Tarak Mehta ka Ulta Chashma like Hindi TV soap would. The way the addition of onions was used to add a bit of natural sweetness to the pork patty at Ling's was impressive. The pork bao or bun at Ling's Pavilion. A Sunday special. For my mains at Theory, I ordered the pan seared grouper. I took my first bite of the the fish, stopped mid conversation, and decided to take a quick picture. By then I had realised that I was in the middle of a very satisfying meal experience and that it would be selfish of me to keep it to myself! The cut of the fish looked similar in shape to a rectangular gaada (back) piece Bengali cut of rohu or kaatla. The sort of cut salmon is served in in the west. I know that I have used already the words 'juicy' and 'moist' in this post but I must add that the grouper at Theory was both. The fish was neither overcooked nor dry. It was done delightfully medium, though not rare. The miso based seasoning was comprehensive and complete. There was a dark brown thick miso sauce served on the side but frankly I didn't need to add anything to the fish. I took a bite of the skin of the grouper and broke into a huge grin. It was 'crispy' just as the menu description promised it would be. I felt so at home. A Bengali home that is. The skin, what one would refer to as the crackling in the west, was the way the skin is meant to be in a good Bengali rui or kaatla fish fry. Nice and 'korkore' or crispy. A childhood pleasure which I try to avoid now that I have grown older because of cholesterol worries that we live with. At Theory, I said 'screw it' to all that and finished the skin with relish. The contrast of the crunchy skin and the soft (in a good way) fish was what they call 'epic' in today's day and age. Adding to the feeling of being at home for this Bengali were the baked baby potatoes serves with the grouper. Maachh with alu is all one could ask for and one got it. There was spinach too but I largely ignored that! Lest my comparison with pakoras, maach bhaja and sheekh lebabs confuse you, let me clarify that there was nothing Indian or 'fusion' about the food here. It's just that the food talked to one's heart. The folks on my table called for desserts while I asked for a cappuccino. The coffee was fairly perfect. Not too hot. Nor lukewarm. The foam properly firm. I didn't call for desserts. I am not supposed to eat them. When I do, I can't stop. So I feel it's best not to start on them! I did take a bite of both the desserts which came to the table eventually. One was the tres leches, sponge cake and condensed milk, very sweet and the warning signals in my head told me to stop while I could, and I did. The other, chocolate cremeux, was a pudding where the chocolate used was intense and dark but this too had a dominant sugary taste which made me stop after a first bite. Dessert to dessert, I preferred the chocolate one. Dark chocolate has been my ally in my effort to cut down on sugar but this has meant that I have increasingly grown fond of chocolate based ones at the expense of others so do keep this mind before deciding on the tres leches. Regardless on what you do, my advise when it comes to dessert is definitely that of moderation if not avoidance. I try to practise it to the extent I can. I took a small spoon of the dessert out of politeness and then took another bite quickly. 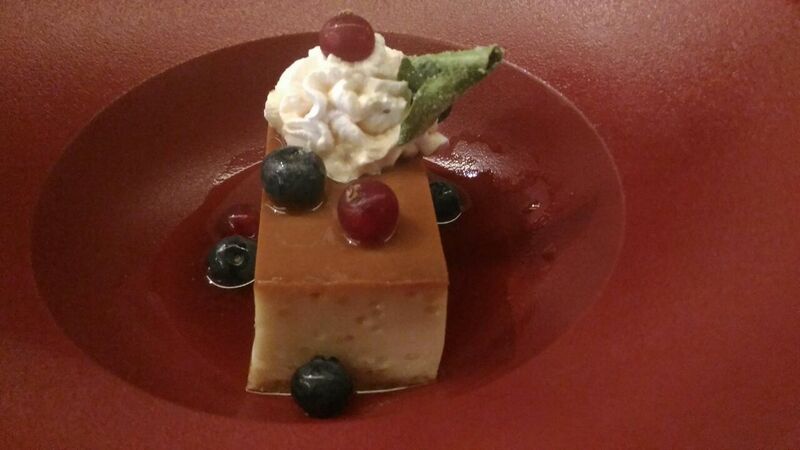 The pudding had a delightful texture, similar to that of a caramel custard but firmer. The sweetness balanced by a citrusy note. This was a dessert which made me reconsider my world views on non-chocolate desserts, and desserts on the whole, and have one more bite. This is why I try not to have desserts at the end of a meal. Sometimes they do turn out be brilliant as it did here and then I can't stop. Thank God for the the three spoons that they had given with it and the fact that I was not alone at the table! I later found out that this was the lemon grass flan and that explained the citrusy aftertaste. My meal at Theory reminded me of one of my favourite restaurants in Bandra, the Salt Water Cafe. We keep going back there to enjoy some good, solid 'western' food. Theory could be the answer to that if I was at Kamala Mills. Coincidentally the kitchens of both are run by the very talented young chefs. Clyde Comello of Theory as well as the very well regarded Gresham Fernandes of Saltwater Cafe, both belong to the East Indian Catholic community, just as chef Aloysius Dsouza (chef Aloo) does. A great gene pool it seems. I later requested chef Clyde to share pictures of the dishes I enjoyed and missed and here they are for you to check out. Note: The meal was hosted by the Alila Hotel group. They have a hotel in Goa under the Alila Diwa name and have just opened a Fort hotel outside of Jaipur where the meals have been curated by vhef Ranveer Brar. During lunch I found out that the Indian partners of Alila Diwa Jaipur own Theory in Mumbai too and seem to be food obsessed. I don't know the prices of the dish as my hosts took the tab and the prices are not listed on Zomato either. I will add these the next time I go there or if I get to know of the prices before that. Disclosures made, I would definitely recommend that you check the food there on the basis of what I ate the day before. For obvious reasons, I can't comment on service and this is not an anonymous review.